The Ribeira Sacra MTB Centre is located in the Sil River Canyon, on the boundary between the provinces of Lugo and Ourense. There are five circular routes covering 110 kilometres, with differing levels of difficulty, from the banks of the Sil to the peaks of the Cabeza da Meda Mountains, offering cyclists the opportunity to explore the municipalities of Nogueira de Ramuín and Parada de Sil. 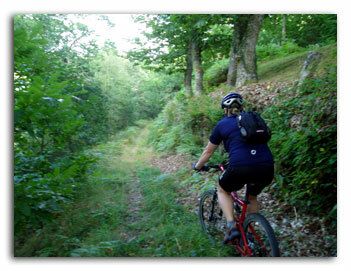 More information at Ribeira Sacra MTB Centre. At San Estevo´s dam, 7km from A Casa da Eira, one can discover the River Sil Canyon with its waterfalls, river beaches and hidden monasteries amongst the chestnut woods and the steep river sides of the river Sil. Different companies specializing in adventure sports are cooperating with A Casa da Eira offering specific technical devices, insurance and guides/instructors for: climbing and rapelling, guided hiking, bungee jumping, gorge descent, canoeing, orientation, quad, archery, and guided bike tours. 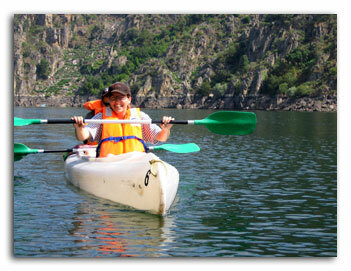 Feel free to ask us about the activity schedules and prices. Advance booking only.